Hypnotoad! | 'TAIN'T THE MEAT… IT'S THE HUMANITY! 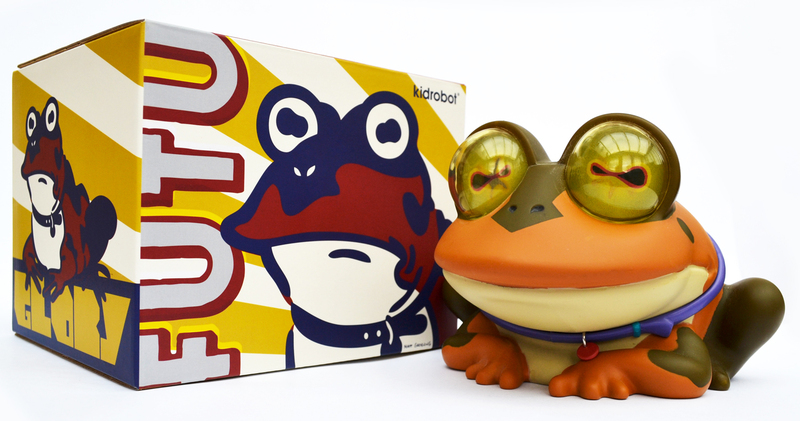 Kidrobot‘s series of oversized vinyl toys based on characters from Futurama added a new addition to its ranks in August 2012: Hypnotoad. Measuring four and a half inches in height, and made from sturdy vinyl, Hypnotoad is the smallest of Kidrobot’s oversized designer toys based on characters from the popular TV show. But size isn’t everything when it comes to this popular character. And although the toy doesn’t come with any accessories or feature any articulation it does feature a pair of pretty cool lenticular eyes. Sadly he doesn’t make his trademark droning hum but who cares, it’s Hypnotoad! First seen in the season three episode The Day the Earth Turned Stupid Hypnotoad was gone on to achieve cult status (not bad for a show where almost everything in it has cult status) even featuring in his own TV show Everybody Loves Hypnotoad, which you can find as an extra on the Benders’ Big Score DVD. Typical of Kidrobot’s toys the figure ships in a brightly coloured and nicely designed box, and although released 18 months ago you can still find the little fella on ebay or Amazon for around £/$40.